PITTSBORO, N.C. (February 26, 2018): The upcoming season of Drag 965 Pro Extreme Motorcycle will arguably be the most exciting in class history. For the first time, turbocharged applications will compete alongside the nitrous mainstays. Primary backer for the class, Drag 965, will usher PXM into this new era, continuing their multi-year sponsorship of the class. Drag 965 will also back PXM teams like reigning champ, Travis Davis. The organization, led by Sheikh Mohammad Khaled Al-Sabah, has done a lot of good in the sport, backing teams, classes and series purely for the love of drag racing. 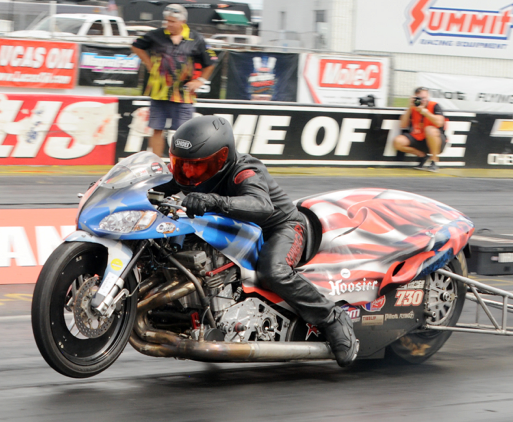 When the first event, the PDRA East Coast Spring Nationals, kicks off at GALOT Motorsports Park in April, turbocharged bikes will compete in Drag 965 Pro Extreme Motorcycle for the first time. Although there is some expected controversy over adding a new powersource, the PDRA looks for this to strengthen the class, bring in new competitors, and provide an added level of competition. Davis said his own father may run a turbo bike at select events this season. A host of other teams have expressed interest in bringing their turbos to PXM. Timblin Chassis is coming back again this year as the Low Qualifier Award sponsor for PXM. Every number one qualifier will get a $300 gift certificate to Timblin Chassis. Other class supporters include Grothus Drag Bikes, Fast by Gast, D.M.E. Racing, Robinson Industries and Williford Racing.